Thanks again to Kalyn at Kalyn’s Kitchen for organising Weekend Herb Blogging. I spent Saturday morning walking around the winter gardens at Anglesey Abbey, near Cambridge. The gardens are remarkable all year round, but the winter shrubs, the famous snowdrops (inedible, I fear, but extraordinary; there are more varieties of snowdrops at Anglesey Abbey than anywhere else in the UK) and the icy, misty walks you can take around the grounds make a sunny, late January/early February day the best time of year to visit. Weekend Herb Blogging was foremost in my mind, so I scurried around looking for plants I knew to be edible. One of the first shrubs I saw was this witchhazel (Hamamelis). 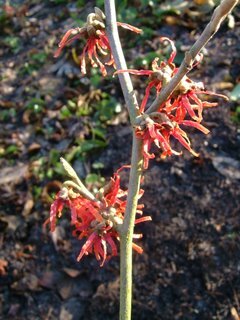 Witchhazel displays these remarkable flowers from January to March. The flowers are delicately scented and last a long time on the bare twigs. 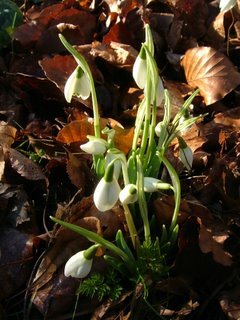 In extreme cold, the petals will close, so the flowers are frost-hardy and a real mood-lifter in the long cold months. Witchhazel is not precisely edible, but it’s used medicinally, and the Cherokee tribes used its inner bark, cooked down to a syrup, for healing wounds, soothing sore throats, and as an astringent. We still use it for its astringent properties these days, and you can make your own tincture by taking a few twigs in winter, before the plant flowers, scraping the bark off and soaking it for a few weeks in a half-water, half-vodka mixture. (Dilute the tincture again with two parts of water before using.) It’s good dabbed on oily, teenage skin. Viburnum is another plant which flowers on bare twigs in the winter, and here I’m luckier with my grotty soil; viburnum will do well anywhere as long as it has decent drainage. 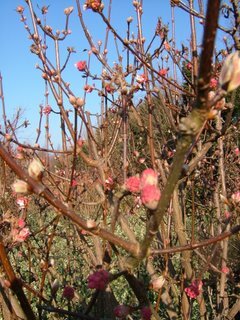 Surprisingly, the berries from Viburnum bodnantense ‘Dawn‘, with its intensely scented, pink flowers, are edible both raw and cooked, and don’t taste at all bad. (You’ll need two bushes if you want the fruit; viburnum is not self-fertilising.) It’s the flowers I want this for, though; the scent from a viburnum bush in the winter will carry for metres in the cold air, perfuming everything around it. Dawn starts to flower in the late autumn and just keeps going until winter is over. I bought a very young specimen in the garden shop when we’d finished our walk; it’s going in front of a laurel tree in the garden later on today. The plant (and its flowers) is hardy down to below -10°C. The gardens at Anglesey Abbey are planned beautifully. After a winding walk through flowering winter shrubs and red-twigged cornus, you’ll come around a corner into a stand of silver birch trees like something straight out of Chekov. The silver birch is an amazingly versatile plant; in Prague last year we saw tiny boxes made from the pressed outer bark, sap-scented and warm to the touch. (Removing this papery outer bark does not kill the tree.) The inner bark can be pulverised and used as a thickening meal. Birch tea is made from the leaves, and a medicinal tea from that resinous inner bark. Sap from the tree is sweet and delicious, and the birch can be tapped like the maple, although too much tapping can kill the tree. In England, this sap was traditionally used to make beer. I found a recipe from John Evelyn’s 1664 Sylva or a Discourse on Forest Trees and the Propogation of Timber in His Majesty’s Dominions (a good read if you are interested in 17th-century fencing techniques) for the beer, which, if you can get your hands on a gallon of birch sap, will be just as good today as it was 350 years ago. To every Gallon of Birch-water put a quart of Honey, well stirr’d together; then boil it almost an hour with a few Cloves, and a little Limon-peel, keeping it well scumm’d. When it is sufficiently boil’d, and become cold, add to it three or four Spoonfuls of good Ale to make it work . . . and when the Test begins to settle, bottle it up . . . it is gentle, and very harmless in operation within the body, and exceedingly sharpens the Appetite, being drunk ante pastum. More on Anglesey Abbey tomorrow. They’ve got a working watermill at the back of the gardens, where I had a very interesting chat with a miller and bought a sack of some flour ground on the premises. Watch this space for some excellent bread and discussion of the sharpening of millstones. Very interesting. I’ve never heard of birch beer. I think all three of these plants will also grow in Utah, although I don’t think I’ve ever seen witch hazel growing. Reading your post makes me wish I was more of a gardener, instead of a serial plant killer. Gorgeous post. On Birch, Alaskan Natives make all manner of basketry and there are canoes made of birch too. There’s a local restaurant that makes a delicious Birch syrup creme brulee. 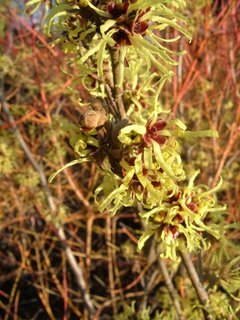 Witch Hazel is a revelation to me. The quality of the light in these photos is remarkable. 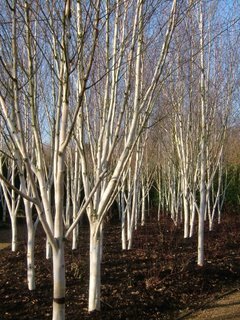 I have been searching for a good photo of the wonderful silver birch trees in the winter garden at angelsey abbey & it was great seeing yours. We now live in the Luberon in France & I was thinking of recreating this in a corner garden we have. Do you think these trees would be suitable in a hot climate – BUT cold in winter?? I haven’t been able to find the name of the designer who created this garden – any ideas? Presume one has to strip outer bark to achieve the stark white. I LOVE this garden. Hope you have an answer.